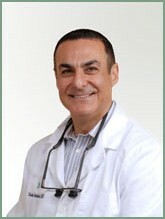 Doctor Kambiz Mahdavi is a graduate of USC School of Dentistry. He first moved to Conejo Valley in 1983. He has lived in Thousand Oaks with his wife, Stephanie, 17-year-old daughter, Shireen, and 15-year-old son, Kaveh, since 2001. Doctor Mahdavi has an extensive array of continuing education in all fields of dentistry, including cosmetics, endodontics, and children's dentistry. He is UCLA certified to administer conscious sedation to children and has provided free kids dentistry to underprivileged children through the AYUDA program, and Children's Dental Center in Inglewood, CA. Doctor Mahdavi knows that not everyone loves going to the dentist, and his comforting chair-side manner makes your visit much easier and more comfortable. His first priority is to get to know you by asking questions and listening to understand your needs and goals.